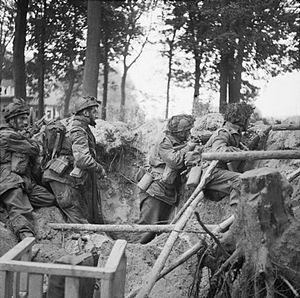 On September 17 1944, the first day of Operation Market Garden, the British dropped 3 battalions of the 1st Parachute Infantry near Arnhem. Their approach routes were designated “Leopard”, “Lion” and “Tiger”. 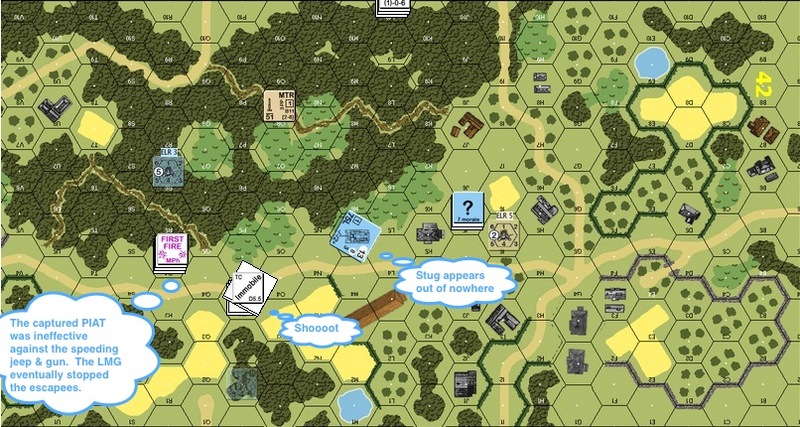 The 3rd Battalion ran into Major Sepp Krafft’s SS Panzer Grenadier Depot and Reserve Battalion 16 (a training battalion) on the “Tiger” route. 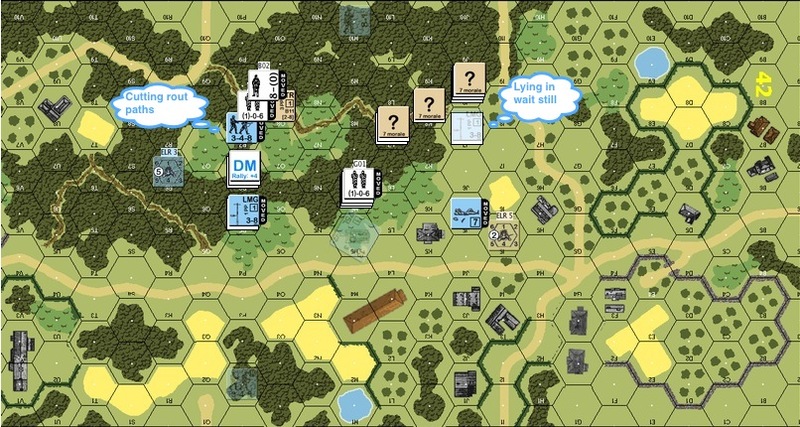 Krafft quickly organised and met the British paratroopers with a defensive block immediately. This scenario uses board 42. The British are to move west to east through the length of the board. The top (northern) half of the board is woods, breaking into orchards about 2/3 of the way to the east. The bottom (southern) half is a small town. There’s a road that runs from west to east and cuts between the woods and the town. 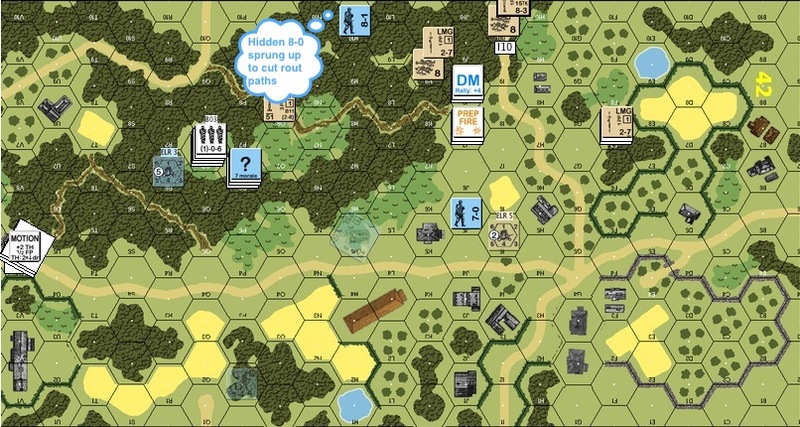 The Germans setup hidden (Hidden Initial Placement). 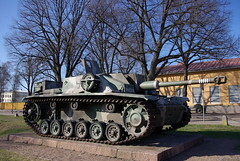 They have half the number of soldiers the paratroopers have but they also have a StuG IIIG(L). The British has a 6-Pounder towed by a jeep. The British win by getting a number of people and hardware off the board. The Germans win by delaying / stopping this travel and by raising the British victory conditions by withdrawing up to the north preferably with British prisoners starting Turn 4. This is the German setup. There are two routes that the British can use – one down the middle of the board and one to the north through the woods. The temptation is to focus on the intersection and that’s where I would expect the Germans to be. I took a gamble and decided to put my units in an ambush configuration in the woods. 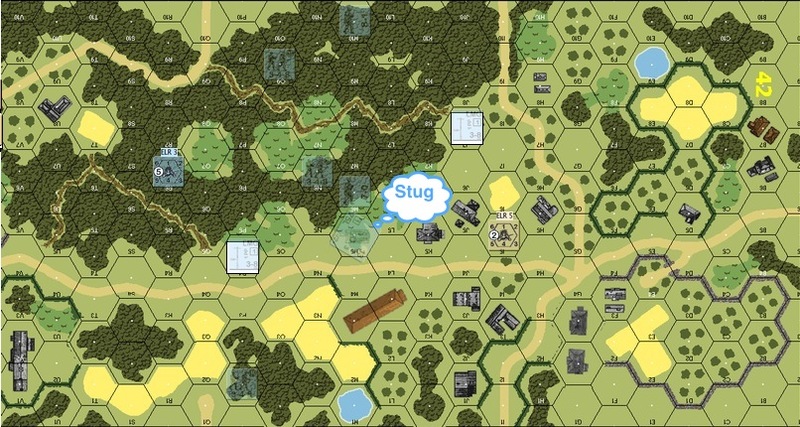 The StuG’s hidden in the brushes around the center of the board. If anything should come down this road, it would be able to shoot it once it cleared the bend. The singular half squad in the southern was nothing more than a speed bump to keep my opponent respectful should I guessed wrong. Being in the north also allowed me to withdraw faster, raising the victory conditions for the British. The paras stepped into the woods. They were ALL in the woods! A para squad bumped into a hidden German half squad and the trap was sprung! One of the para squads fought back valiantly and captured the German half squad. 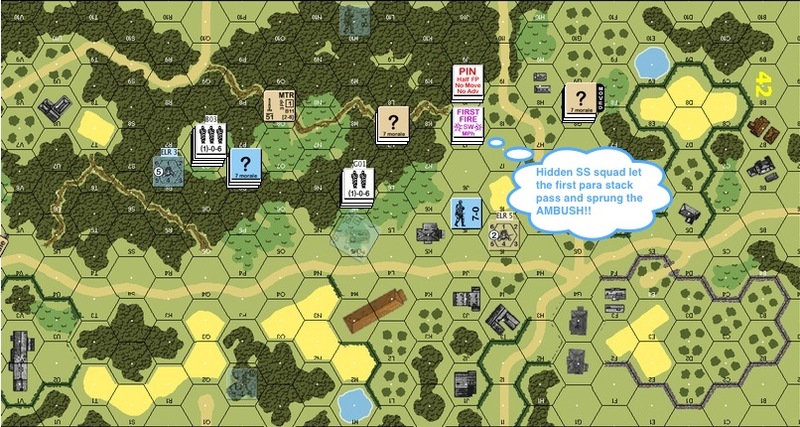 A broken para squad routed straight into a hidden German half squad who took them all prisoners.The hidden German 7-0 turned tail and routed away to avoid close combat. 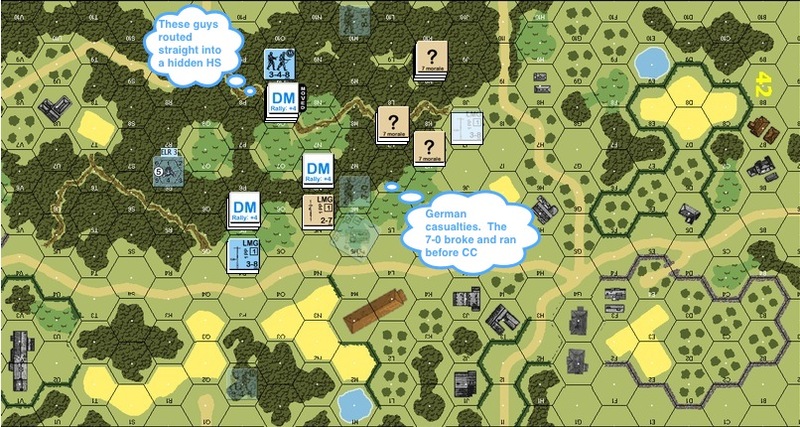 In the following Axis turn, the Germans trapped and captured more British paras in the woods. In the north side of the woods, the other group of paras sped on. The lone SS squad let the first stack go by and ambushed the second squad. The third squad rushed in to help but were ineffective. A hidden 8-0 sprung up to cut rout paths again and took more prisoners. The jeep & gun was now around the bend, all 5 victory points worth!! It was the last round for the British and they decided to make an end to end dash across the board. 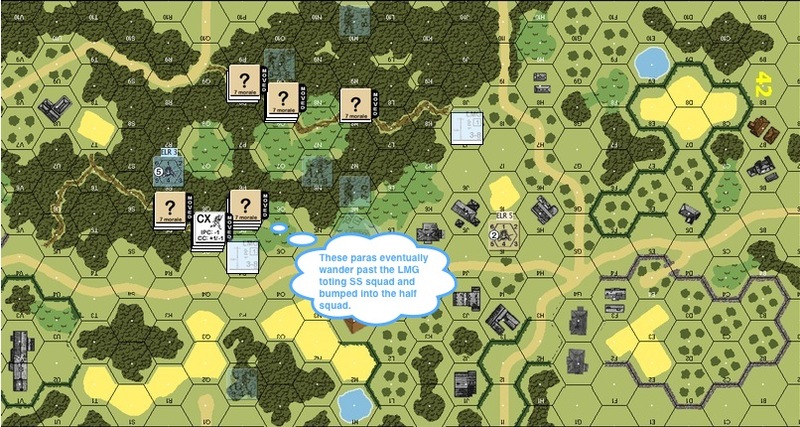 It sped by the Germans holding a captured Piat in the woods but that shot went wide. The squad then opened up with their light machine gun and immobilized the jeep. For a moment there they were, gun and jeep in the middle of the road. Then the brushes rustled and the StuG appeared. And they were blown sky high. 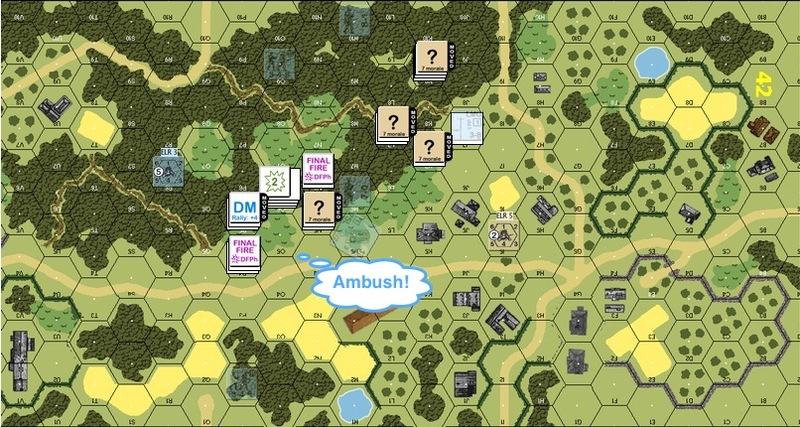 This entry was posted in Game Play and tagged AAR, Advanced Squad Leader, Airborne forces, Arnhem, ASL, Board Game, board wargame, Hong Kong, Operation Market-Garden, PBEM, Red Devils, Scenario, VASL. Bookmark the permalink. Great as always. You appear to be talented at using Hip the way it was intended as your tactical traps seemed to fire quite nicely. It it wasn’t a fluke you should be deadly playing with the Japanese…. Mate, still learning. I got lucky with this one! Thanks and I hope all is well! !